AVAST Software is proud to be a champion of Data Privacy Day, celebrated every year on January 28th. We encourage you to make protecting privacy and data a greater priority. 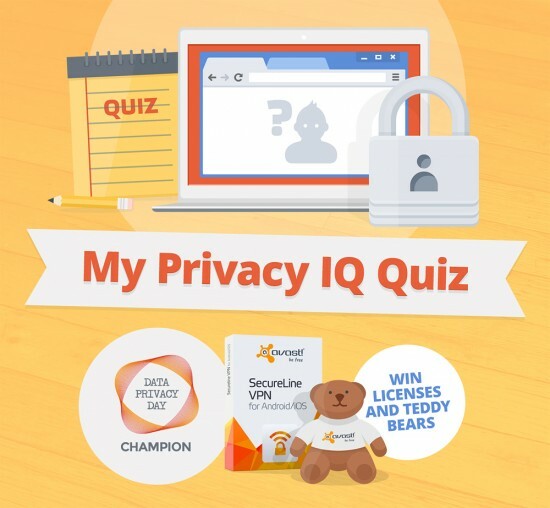 Read on to find out if you are a Privacy Pro! 1) Do privacy policies guarantee that your information will be kept private? 2) Which of these are not recommended to share while using a public WiFi connection? 3) You really need to purchase a late birthday gift for your friend online but you are away on vacation. You have paid for a hotel public WiFi connection so your personal information will be secure. It’s ok to purchase a gift for your friend while using the hotel public WiFi. 4) What is the best way to use social networking sites? A. Set the privacy and security settings to your personal comfort level for information sharing. B. Avoid sharing compromising photos and information. 5) Once I set my privacy settings on a product or service, I don’t need to set them again. 6) All mobile apps that ask you to enable geolocation services require location data to function. 7) Which one of these passwords is the strongest? 8) This should be your password for every site so it is easier to remember. 9) What is a cookie? 10) Answer this final question in the blog comments for a chance to win! How much do you value your online privacy?